Snake has been kicking around in various iterations since the mid-70s, and most of us have either played it, or have seen it played, in one form or another. (The Light Cycles in Tron? That's Snake.) It was a popular game on early personal computers, back when they came with BASIC installed and you'd spend hours typing in programs from magazines (and then many more hours trying to figure out where you screwed up.) In those pre-controller days, Snake was played with a keyboard, but now, thanks to the magic of modern technology, you can actually play it on a keyboard. 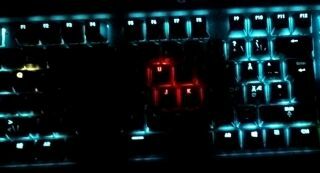 I guess this is why they call it a “gaming keyboard,” eh? Eh? Boy, tough crowd. Let us know in the comments if you get Snake on a Keyboard running on other hardware.